Karate can also be described as a martial art, or fighting method, involving a variety of techniques, including blocks, strikes, evasions (dodge), throws, kicks, punches, and joint manipulations (Joint breaking). Karate practice is divided into three aspects: Kihon (基本, きほん basics), Kata (形,型 forms or patterns of moves), and Kumite ( 組手 sparring). The word karate is a combination of two Japanese characters: Kara, meaning empty, and Te, meaning hand; thus, karate means "empty hand." Self-control is one of the most important life skills that Karate Martial Arts teaches you. In fact, self-control is the key attribute that helps you develop self-discipline, which is essential to reach your goals. Self discipline is also one of the keys to excellence in karate martial arts. We all karate practitioners must NOT BE poisoned by the seven poisons such as: greed, anger, hatred, stupidity, conceit, jealousy and malice. We must do to cultivate the power of courage by strengthening our mind and body and overcoming any difficulties in our life. We all instructors and students should ABSTAIN from all evil, committing murder, suicide, stealing, lying, betraying, sexual misconduct, adultery, polygamy, homosexuality and bullying. I think each of everyone has ups and downs, happy and sorry, wins and lose, loves and hate in their lives. You practice how to be honest to yourself and to be honest to others. You study how to be humble to yourself and to be humble to others. How to reduce hatred and how to stop the hatred? How to reduce anger quickly? How to control your mind? How to stop arrogance and belligerence? The martial arts philosophy, or at least the traditional karate philosophy, is called the ethics of karate. We need to be PATIENT. We need to be HUMBLE. We need to be FORGIVENESS. Patience is the best part of human nature. Forgiveness is the best part of human nature. You can hate (fight back) to your enemies if you cannot forgive them, BUT you don't use your counter attack deadly force on him/ them. You don't destroy their lives. You want to protect yourself in cases like these. It's only natural. But you should know about the legal limits on self-defense. The laws on self-defense vary from one event to another event, but in general you're allowed to use reasonable physical force to protect yourself from imminent or immediate physical injury. You can only use that amount of force that's necessary to stop the threat of harm. The other person lunges at you or tries to punch you, kick you, you can protect (counter attack) yourself by fighting back. If you fight back and the other person gives up or is unable to defend himself, you do NOT continue to hit him - it's an unreasonable use of force. If the other person doesn't come close enough to you to actually hit you and he doesn't have a weapon and he starts to walk away, you can't chase after him and hit him - the threat of harm to you isn't imminent. These are very simple examples and very general rules. The facts and circumstances of each case and the laws in your country will determine if you acted properly in defending yourself. 彼らは彼らの一生の間に多くの学生を教えていた。This list is incomplete. Other famous students and instructors left in the lists above. I apology if I can't mention all students completely. They had taught large number of students in their lifetime. Next, he who would study Karate-do must always strive to be inwardly humble and outwardly gentle. However, once he has decided to stand up for the cause of justice, then he must have the courage expressed in the saying, "Even if it must be ten million foes, I go!" Thus, he is like the green bamboo stalk: hollow (Kara) inside, straight, and with knots, that is, unselfish, gentle, and moderate. This meaning is also contained in the element kara of Karate-do. Karate (空手) is a martial art developed in the Ryukyu Islands in what is now Okinawa, Japan. It developed from the indigenous martial arts of Ryukyu Islands (Okinawa). Karate is a striking art using punching, kicking, knee strikes, elbow strikes and open hand techniques such as knife-hands, spear-hands, and palm-heel strikes. In some styles, grappling, throws, joint locks, restraints, and vital point strikes are also taught. A karate practitioner is called a karate-ka. It must adhere to the traditional values and principles of karate. It must be realistic in blocking and fighting terms and display concentration, power, and potential impact in its techniques. It must demonstrate strength, power, and speed — as well as grace, rhythm, and balance. It must be performed with competence and a clear understanding of the techniques. We need to understand such as good timing, rhythm, speed, balance, and focus of power (KIME). The principles of Karate techniques are based on the design of the human body. For power the body develops the larger, powerful muscles of the torso. The speed of the techniques comes from the fast, agile muscles of the arms and legs. As students progress in REAL Karate, they learn to coordinate this speed and power, and develop a concentration to focus all of their body's strength into a small, hard striking surface like the edge of the hand or the heel of a foot. Karate is not just a physical activity. Karate is the martial art that trains people physically and mentally. In addition to physical fitness, Karate classes promote discipline, honor, self-control, respect, courtesy, perseverance and loyalty. Karate training will improve your stamina, strength, speed and flexibility. Because of the intensity of the training karate will improve your overall fitness and body awareness. Karate training will strengthen and develop almost every muscle in your body. Through proper dedicated training you can expect to reduce your resting heart rate and feel healthier. Shotokan Karate is one of the oldest and most influential styles of karate. Shotokan has many benefits. It helps to develop patience, courage, self-confidence, self-control, strength, flexibility, calmness and concentration. It is well known that Shotokan Karate is one of the most powerful methods of self defense and physical fitness regimes available anywhere and is an excellent, time-proven method of personal development. Shotokan Karate training has been recognized worldwide for producing physically powerful, sporting spirit, and highly focused human beings. With its special emphasis on “Zanchin,” a Japanese word meaning “mental focus,” and “Kime”, or the focusing of physical power. Kime is a commonly used Japanese martial arts term. In karate it can mean "power" and/or "focus," describing the instantaneous tensing at the correct moment during a technique. Shotokan Karate has refined the art of mental and physical concentration to the highest degree. As a result, traditional karate students tend to experience significant improvements in their physical fitness, self esteem and academic studies. Funakoshi Gichin (船越 義珍) was born November 10, 1868. He died in 1957 at age 89, after humbly making the largest contribution to the art of Karate-Do. He is the founder of Shotokan (松濤館) Karate-Do, perhaps the most widely known style of karate, and is attributed as being the "father of modern karate". Master Funakoshi Gichin was also the founder of what is now known as Shotokan karate and J.K.A (日本 空手 協会 Japan Karate Association). The Shotokan 松濤館 is the most famous karate style in the world. Then J.K.A is the very famous karate school in the world. 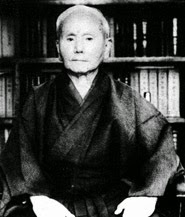 Master Gichin Funakoshi, founder of Shotokan karate, is generally credited with having introduced and popularized karate on the main islands of Japan. In addition many Okinawans were actively teaching, and are thus also responsible for the development of karate on the main islands. Funakoshi was a student of both Asato Ankō and Itosu Ankō (who had worked to introduce karate to the Okinawa Prefectural School System in 1902). During this time period, prominent teachers who also influenced the spread of karate in Japan included Kenwa Mabuni, Chōjun Miyagi, Motobu Chōki, Kanken Tōyama, and Kanbun Uechi. He always referred to what he taught as simply karate, but in 1936 he built a dojo in Tokyo and the style he left behind is usually called Shotokan after this dojo. Shotokan (松濤館) is the most famous style of karate, developed from various martial arts by Gichin Funakoshi (1868–1957) and his son Sensei Yoshitaka Funakoshi, also known as Giko. Master Gichin was born in Okinawa and is widely credited with popularizing "karate do" through a series of public demonstrations, and by promoting the development of university karate clubs in Japan. As the most widely practiced style, Shotokan is considered a traditional and influential form of karate do. Shotokan was the name of the first official dojo built by Master Gichin Funakoshi, in 1936 at Mejiro, and destroyed in 1945 as a result of an allied bombing. Shoto (松濤 Shōtō), meaning "pine-waves" (the movement of pine needles when the wind blows through them), was Funakoshi's pen-name, which he used in his poetic and philosophical writings and messages to his students. The Japanese kan (館 kan) means "house" or "hall". In honor of their sensei, Funakoshi's students created a sign reading shōtō-kan, which they placed above the entrance of the hall where Funakoshi taught. There are a number of great Shotokan karate teachers in the world today who are unique enough in their own right to be referred to as, "modern masters". Some of these individuals were direct students of either Sensei Gichin Funakoshi, or of his son Sensei Yoshitaka Funakoshi, others were not. However, that in no way diminished their knowledge, their skill, or their right to be considered in the same company as those who began their training at the original Shotokan dojo so many years ago. Today, however, most of these sensei's have long since branched out and formed their own unique organizations, yet they all still share a deep common desire, and that is to see the art Shotokan Karate-Do and the basic underlying principles of Sensei Gichin Funakoshi, spread to all corners of the globe. 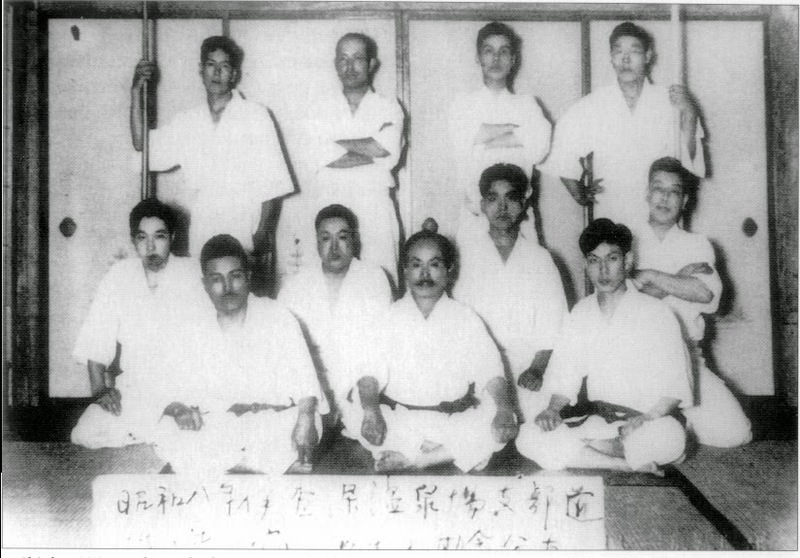 Funakoshi was the formal head of the organization, with Sensei Masatoshi Nakayama appointed as Chief Instructor. 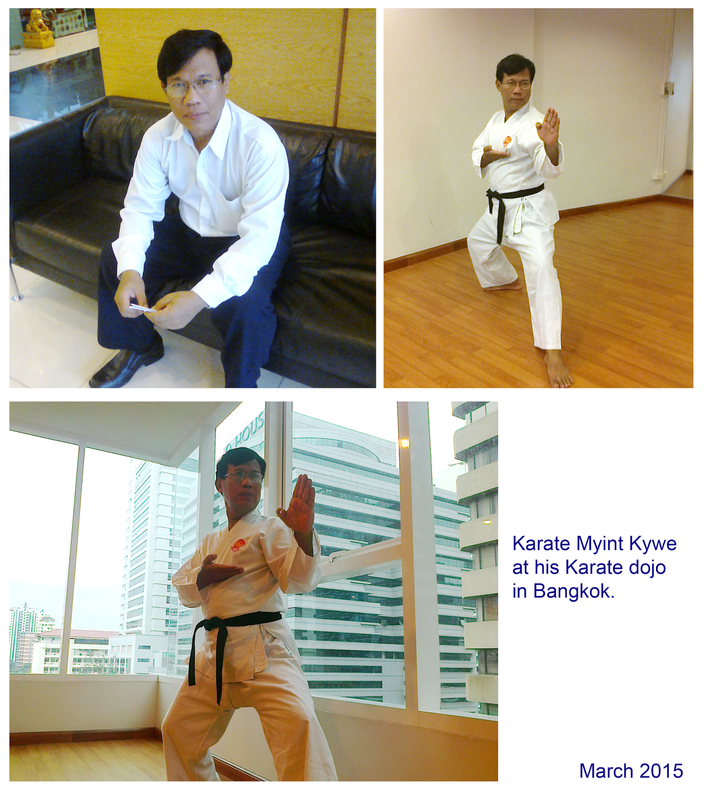 · It is important that karate can be practiced by the young and old, men and women alike. That is, since there is no need for a special training place, equipment, or an opponent, a flexibility in training is provided such that the physically and spiritually weak individual can develop his body and mind so gradually and naturally that he himself may not even realize his own great progress. · Karate-Do strives internally to train the mind to develop a clear conscience, enabling one to face the world honestly, while externally developing strength to the point where one may overcome even ferocious wild animals. Mind and technique become one in true karate. · When you look at life think in terms of karate. But remember that karate is not only karate -- it is life. · To search for the old is to understand the new. The old, the new, this is a matter of time. In all things man must have a clear mind. The Way: Who will pass it on straight and well? · Karate is a technique that permits one to defend himself with his bare hands and fists without weapons. · Just as it is the clear mirror that reflects without distortion, or the quiet valley that echoes a sound, so must one who would study Karate-Do purge himself of selfish and evil thoughts, for only with a clear mind and conscience can he understand that which he receives. · He who would study Karate-Do must always strive to be inwardly humble and outwardly gentle. However, once he has decided to stand up for the cause of justice, then he must have the courage expressed in the saying, "Even if it must be ten million foes, I go!" Thus, he is like the green bamboo stalk: hollow (kara) inside, straight, and with knots, that is, unselfish, gentle, and moderate. · There are many kinds of martial arts, Judo, Kendo, Aikido, Jujitsu, etc at a fundamental level these arts rest on the same basis. It is no exaggeration to say that the original sense of Karate-Do is at one with the basis of all martial arts. Form is emptiness, emptiness is form itself. The kara of Karate-Do means this. 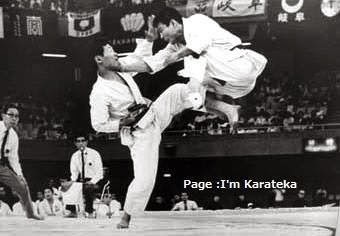 · The correct understanding of Karate and its proper use is Karate-do. One who truly trains in this do [way] and actually understands Karate-do is never easily drawn into a fight. · Students of any art, including Karate-do must never forget the cultivation of the mind and the body. · To win one hundred victories in one hundred battles is not the highest skill. To subdue the enemy with out fighting is the highest skill. · The ultimate aim of the art of karate lies not in victory or defeat, but in the perfection of the characters of its participants. Kihon is a Japanese term meaning "basics" or "fundamentals." The term is used to refer to the basic techniques that are taught and practiced as the foundation of most Japanese martial arts. 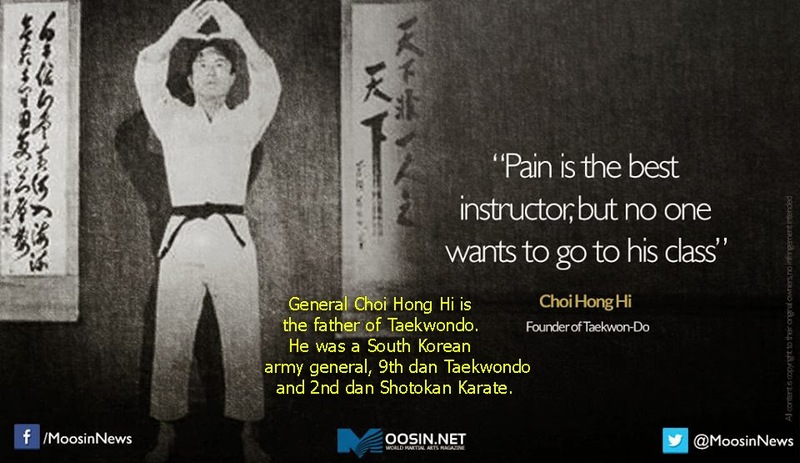 Kihon is not only practicing of techniques, it is also the karateka fostering the correct spirit and attitude at all times. Kihon techniques tend to be practiced often, in many cases during each practice session. When the JKA was formed, M. Nakayama laid down 27 kata as the kata syllabus for this organization. Even today, thousands of Shotokan dojo only practice 26 of these 27 kata. The standard JKA kata are: Taikyoku shodan (sometimes termed Kata Kihon or Kihon Kata, the name has been discontinued in some Shotokan dojos) (太極初段), Heian shodan (平安初段), Heian nidan (平安二段), Heian sandan (平安三段), Heian yondan (平安四段), Heian godan (平安五段), Bassai dai (披塞大), Jion (慈恩), Enpi (燕飛), Kanku dai (観空大), Hangetsu (半月), Jitte (十手), Gankaku (岩鶴), Tekki shodan (鉄騎初段), Tekki nidan (鉄騎二段), Tekki sandan (鉄騎三段), Nijūshiho (二十四步), Chinte (珍手), Sōchin (壯鎭), Meikyō/Rōhai (明鏡), Unsu (雲手), Bassai shō (披塞小), Kankū shō (観空小), Wankan (王冠), Gojūshiho shō (五十四歩小), Gojūshiho dai (五十四歩大), and Ji'in (慈陰). Free sparring (or free style) (jiyu kumite) is the last element of sparring learned. In this exercise, two training partners are free to use any karate technique or combination of attacks, and the defender at any given moment is free to avoid, block, counter, or attack with any karate technique. Training partners are encouraged to make controlled and focused contact with their opponent, but to withdraw their attack as soon as surface contact has been made. This allows attacking a full range of target areas (including punches and kicks to the face, head, throat, and body) with no padding or protective gloves, but maintains a degree of safety for the participants. in free sparring, but it is unusual for competition matches to involve extended grappling or ground-wrestling, as Shotokan karateka are encouraged to end an encounter with a single attack (ippon), avoiding extended periods of conflict, or unnecessary contact in situations where there may be more than one attacker. · Have concentration of mind. Please watch this video. This video involves ancient Karate tournament videos and photos and how I punched a candle flame out with used KIME (focus). Mastering a quick (High speed), powerful punch, kick, and strike are fundamental to becoming a good karate master. It starts with perfecting your form and using your whole body, not just your arm, to generate force. E is energy, m is mass, and c is the speed of light in a vacuum. Since then, E=mc2 has become one of the most famous equations in the world. Even people with no background in physics have at least heard of the equation and are aware of its prodigious influence on the world we live in. The amount of KE (kinetic energy) of the hand/forearm when in motion (or the amount of energy that the hand/forearm can impart to the board) is proportional to the square of its velocity; that is why the key ingredient to breaking the board is to have the hand/forearm moving at a high velocity. Don’t forget relaxed your body and mind, will power, self confidence, impact, ability of focusing, concentration of power, speed, tense and solid to increase mass. Therefore the purpose of tensing the muscles of the body on impact is to increase the effective mass of the technique. There is a compromise which assures that maximum momentum (mass x velocity) is available upon impact with target. Depending on the target and the strategy, various proportions of mass and velocity may be selected to contribute to produce large momentum. This is the essence of "focus 決め(焦点) Kime." The Japanese word kime is often translated as ‘focus.’ Among other things, kime is designed to increase the effective mass behind a punch. 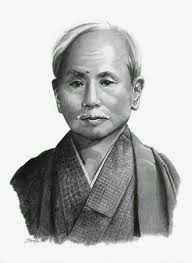 Sensei Funakoshi wrote the Niju Kun (Twenty Precepts) to help karate students transform their art into a way of life. Each line contains superficial meaning as well as deeper truth that could take a lifetime to fully understand. The original Japanese text is terse and meant to be thought provoking. Accordingly, English translations vary with individual interpretation. Below is a synthesis of a number of these interpretations. 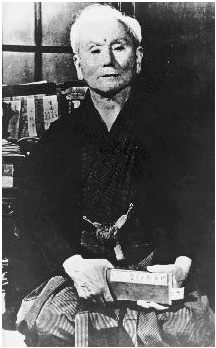 The son of the Founder of Shotokan Karate, Master 首席師範 Gichin Funakoshi, Sensei Yoshitaka Funakoshi, also known as Giko, was lost to us in his late thirties as a direct result of tuberculosis which had afflicted him since childhood. During his short life his impact on Shotokan Karate was truly profound. He was amongst other things, responsible for the introduction of new ways of kicking. 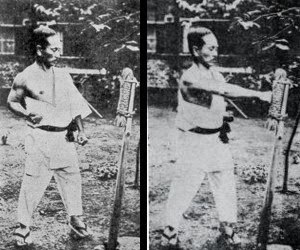 These methods included, mawashi geri, yoko geri kekomi, yoko geri keage, fumikomi, and ushiro geri. Although small in stature by Western standards Sensei Yoshitaka was a very powerful individual. By using all of his body weight, and introducing the full extension of the hip, he gave us a more dynamic way of creating power while at the same time adding a greater range to all these methods of kicking. 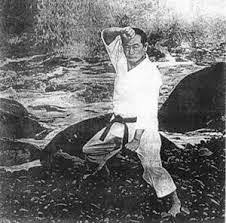 In addition, the low stances that today characterize the modern Shotokan style came about as a direct result of Sensei Yoshitaka's training methods, as well he established the fundamental kumite methods we use today such as, Ippon Kumite, Jiyu Ippon Kumite, and Gobon kumite along with other fighting techniques. There is simply no telling where our basics and katas would be today had he lived to an old age. 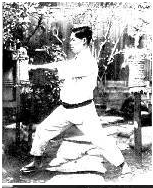 The kata Wankan is said to have been created by him and that it's short duration, only twenty movements, is due to the fact that he never was able to complete the kata. His death in 1945 was a great loss not only to his family, but also to the future of Shotokan karate. Masatoshi Nakayama 先生 is known today as the most famous student to have trained directly under Master Gichin Funakoshi. Masatoshi Nakayama (中山正敏 初代首席師範) Nakayama Masatoshi, April 13, 1913 – April 15, 1987) was an internationally renowned Japanese master of Shotokan karate. He helped establish the Japan Karate Association (JKA) in 1949. Instrumental in the founding of the in 1949 Master Nakayama is also best known for the introduction of more scientific ways of training and for the JKA's decision to send JKA instructors overseas to Hawaii and Europe starting in the 1960's in order to spread the art of Shotokan Karate beyond the shores of Japan. awarded the rank of 10th dan. Born in Tokyo in 1928, Sensei Hidetaka Nishiyama was one of the very few instructors who began karate training directly under Master Gichin Funakoshi, which he did in 1943 at the original Shoto Kan dojo. Two years later he enrolled in Takushoku University where he joined the karate team ultimately becoming Team Captain. A co-founder and member of the Board of Directors of the Japan Karate Association (JKA) Sensei Nishiyama was also the co-founder of the All Japan Collegiate Karate Federation, and was elected its first chairman. Also an author, his book "Karate, The art of Empty Hand Fighting", is one of the most popular books ever written on the art of Shotokan Karate. In 1985 Sensei Nishiyama formed the International Traditional Karate Federation, as a true Master of Karate, Sensei Nishiyama continues his lifelong goal of pioneering the art of traditional Japanese karate by conducting seminars throughout the world. Sensei Nishiyama's passing is a great loss to our worldwide Shotokan family. 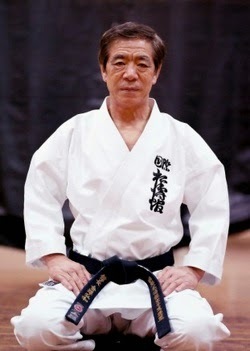 For additional information on Sensei Nishiyama please visit the ITKF web site at http://www.itkf.org/ . Sensei Teruyuki Okazaki was born in Fukuoka Prefecture, Japan, and he began his karate training at the age of sixteen when he entered Takushoku University in 1948. For the next ten years he would remain a direct student of Sensei Gichin Funakoshi, the Founder of Shotokan Karate, until Sensei Funakoshi's death in 1957. After Sensei Funakoshi's death Sensei Okazaki came under the guidance of Sensei Matsatoshi Nakayama, whom he assisted for many years, during which he was instrumental in the establishment of tournament rules and much of the curriculum for the then fledgling JKA'S Instructors Program. The first three graduates of that program were Sensei Mikami, Sensei Kanazawa and Sensei Takaura. 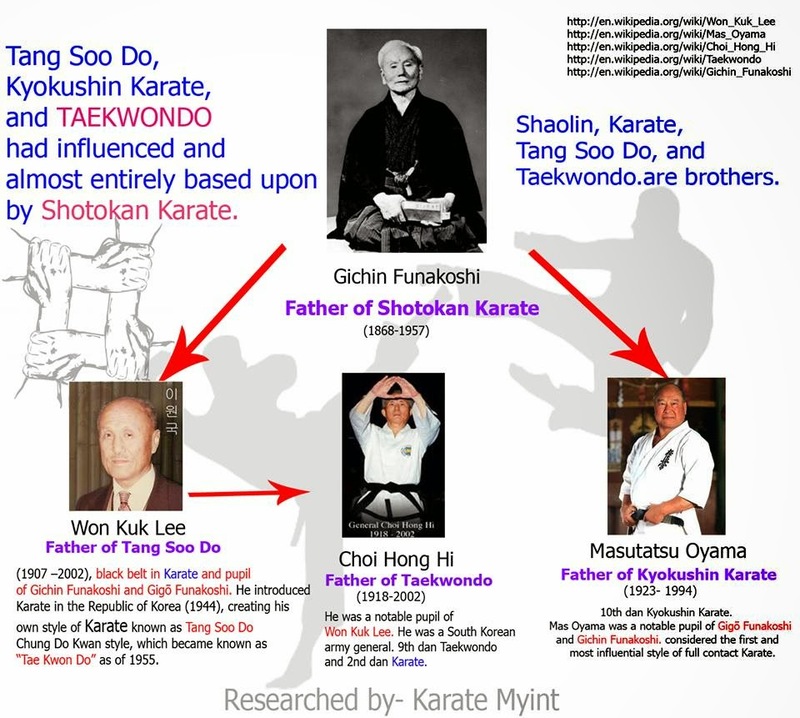 In 1961 as the second instructor to be sent overseas (after Sensei Kanazawa), Sensei Okazaki located in Pennsylvania, USA, where was responsible for the wide spread growth of Shotokan karate in the United States of America. Today the Chief Instructor of his own organization which he formed in 1977, known as the International Shotokan Karate Federation (ISKF) which is headquartered in Philadelphia, Sensei Okazaki still remains closely affiliated with the JKA. 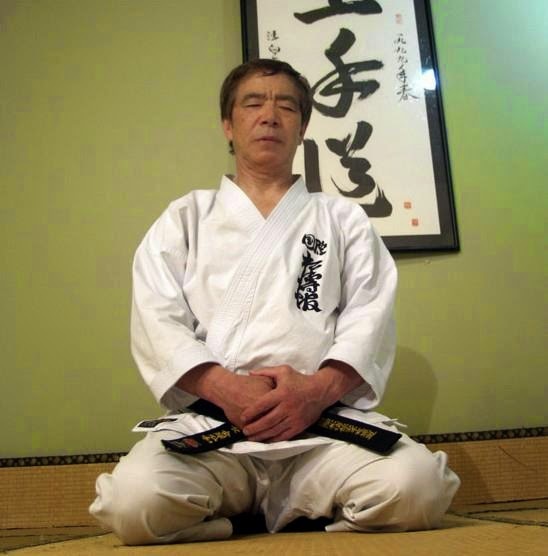 For additional information on Sensei Okazaki please visit the ISKF web site at http://www.iskf.com . Born in Chiba, Japan in 1929 Sensei Kase's was one of the few who could lay claim to having been taught at the original Shotokan dojo by the son of the Founder of Shotokan karate, Sensei Yoshitaka Funakoshi, the depth of Sensei Kase knowledge and skill was said to be enormous. 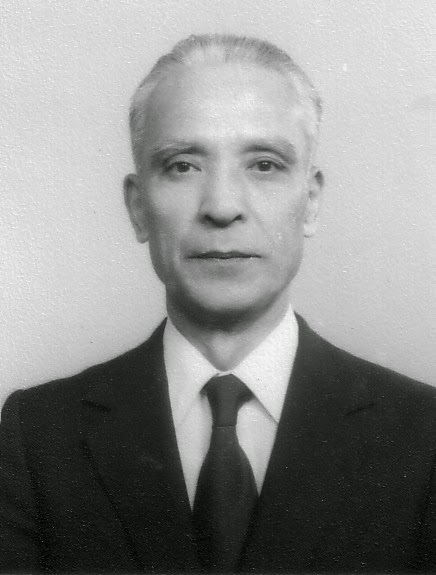 After the end of the World War II Sensei Kase continued to train at university, he joined the fledgling Japan Karate Association (JKA) in 1950 becoming a Director. In addition he was responsible for teaching the first post war generation of international instructors Sensei's Kanazawa, Sensei Enoeda, and Sensei Shirai. 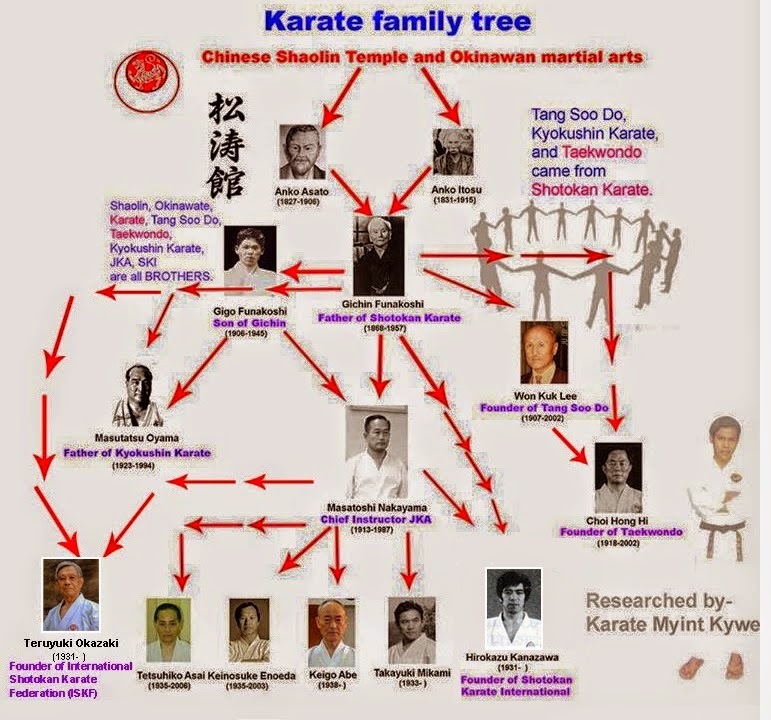 Sensei Kase remained a member of the JKA until 1989 at which time he co-founded with Sensei Hiroshi Shirai and organization known as, the World Shotokan Karate-Do Academy (WKSA) which focused on returning to the teachings of his teacher Sensei Yoshitaka Funakoshi. The WSKA currently restricts the members of its organization to 3rd Dan and above. Sensei Kase's recent passing is a great loss to the world wide Shotokan family. For additional information on Sensei Kase please visit the WSKA web site at http://www.leicesterkarateclub.co.uk/imprintofamaster.htm . Born in Iwate Prefecture in Japan in 1931, Shihan Hirokazu Kanazawa is one of the best known and most widely respected Shotokan karate Masters in the world today. 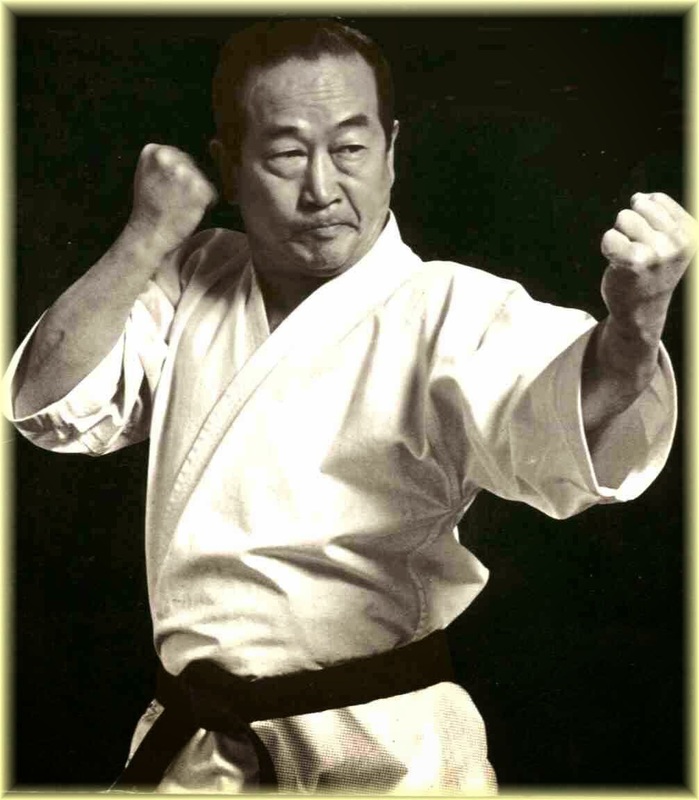 Shihan Kanazawa's karate was honed during his time at Takushoku University, after graduating he joined the JKA in 1956 becoming a direct student of Sensei Masatoshi Nakayama, and he became one of the first graduates of the Japan Karate Associations legendary Instructors Training Program. 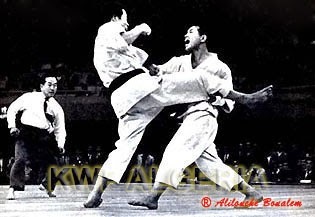 His victory in the 1957 "All Japan Karate Championships" and subsequent victory in both kata and kumite in the 1958 "All Japan Karate Championship" ultimately led the JKA to send Shihan Kanazawa overseas to Hawaii in 1961. While there he was to become the first Shotokan sensei to instruct Shihan Kenneth Funakoshi, 9th Dan, Chief Instructor, of the Funakoshi Shotokan Karate Association. 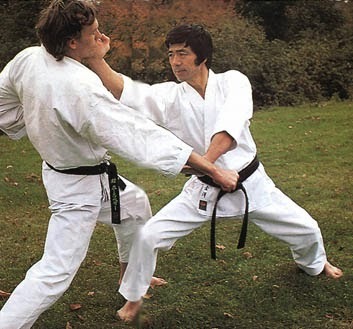 Several years later Shihan Kanazawa would move to England to become the Chief Instructor for the Karate Union of Great Britain. In 1977 in a surprising move Shihan Kanzawa left the JKA and formed his own organization the Shotokan Karate International Federation (SKIF). Shihan Kanzawa is currently ranked 10th Dan and is the only living Shotokan Master to currently hold this rank. 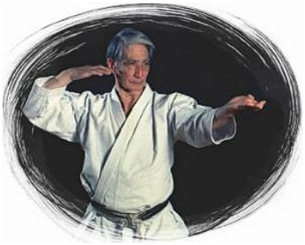 For additional information on Shihan Kanazawa please visit the SKIF web site at http://www.skif.jp/index-e.htm. 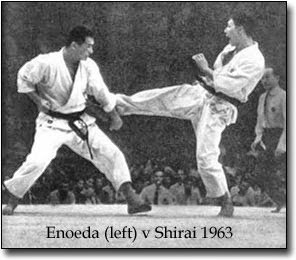 Born in Fukuoka, Japan in 1935 Sensei Enoeda was descended from samurai lineage and as such was drawn to martial arts from an early age, attaining his Ni Dan in Judo by the age of sixteen. Fate, however, was to see him walk a different road. His first introduction to karate came when he witnessed a demonstration of karate at Takushoku University, he was so impressed that he enrolled in the university as a business major in order to be able to study karate. After enrolling in Takushoku University he joined the karate club, within two years of joining he had earned the rank of Shodan, and he ultimately went on to become the club Captain. After graduating from university he entered the JKA'S Instructor Program where he was to spend the next three years under the watchful eye of Sensei Matsatoshi Nakayama. As a top competitor, and JKA Champion, Sensei Enoeda become known as the "Tiger of Shotokan" a name that would one day be known worldwide. Sent overseas to the United Kingdom in 1965 he settled in Liverpool, where he was to set the tone for English Shotokan karate that was to last for the next forty years. Today the Karate Union of Great Britain continues his legacy. Sensei Enoeda's recent passing is another great loss for the world wide Shotokan family. 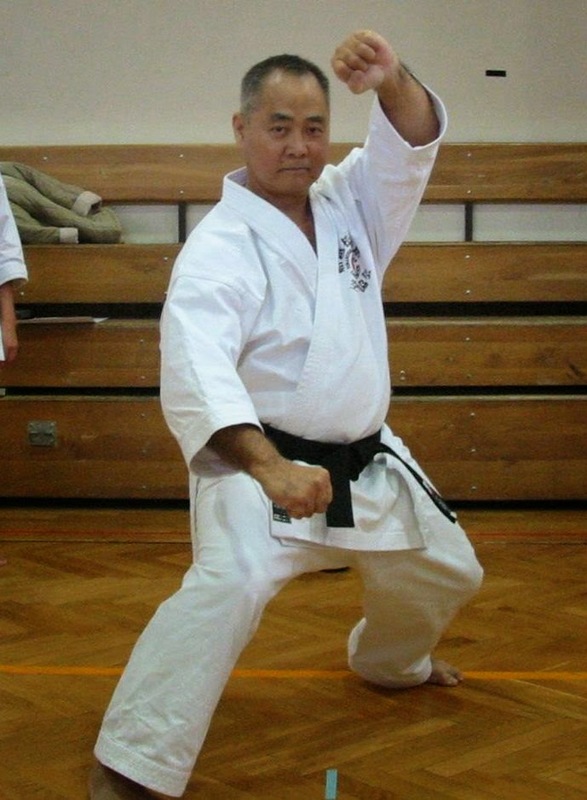 For additional information on Sensei Enoeda please visit the KUGB web site at http://www.kugb.org/profiles/profiles_enoeda.html . Shihan Kenneth Funakoshi, Founder and Chief Instructor of the Funakoshi Shotokan Karate Association, started judo training in 1948 under Arakaki Sensei at the Fort Gakuen Japanese Language School in Honolulu, Hawaii. He attended Farrington High School in the Kalihi District and was on the football team and captain of the Territory of Hawaii (Hawaii was not a state yet) Championship swim team. While attending the University of Hawaii on a swimming scholarship Funakoshi Sensei started Kempo training under Adriano Emperado from 1956 to 1959. In 1960, Shihan Funakoshi started Shotokan training when the Japan Karate Association (JKA) assigned its first Grand Champion, Sensei Hirokazu Kanazawa, to teach at the Karate Association of Hawaii, Shihan Funakoshi remained a student of Sensei Kanazawa's for the next three years. Then from 1963-1966 Shihan Funakoshi trained under Sensei Masataka Mori, another instructor from the JKA. Finally from 1966 to 1969, he trained under the third and last instructor sent by the JKA, the legendary Sensei Tetsuhiko Asai, another former Grand Champion from Japan. 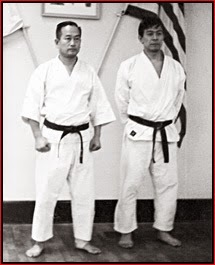 In 1969, after training ten years under three of Japan's top Shotokan instructors and then winning the Grand Championship of the Karate Association of Hawaii for five years in a row (1964-1968), Shihan Funakoshi was appointed as the Chief Instructor for the Karate Association of Hawaii. Shihan Funakoshi moved to San Jose, California to teach karate in December 1986. In 1987, the non-political Funakoshi Shotokan Karate Association was founded with its world headquarters now in Milpitas, California and the organization now has affiliates throughout the United States, Canada, England, Ireland, Europe, Russia, Mexico, and many other countries around the world. 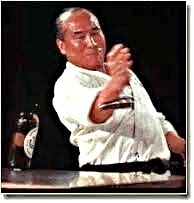 For additional information on Shihan Funakoshi please visit the FSKA web site at http://www.fska.com/ . Born in Hiroshima, Japan in 1932, Sensei Yaguchi is another of the very few remaining masters to have trained under the Founder of Shotokan karate, Master Gichin Funakoshi's. In addition to grading for his first and second Dan under Master Funakoshi, Sensei Yaguchi was also one of the first of many to graduate from the legendary JKA Instructors Training Program. 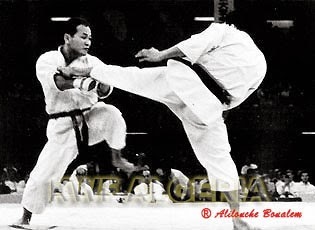 As strong competitor Sensei Yaguchi placed third in the kumite at the 1963 JKA All Japan Championship. 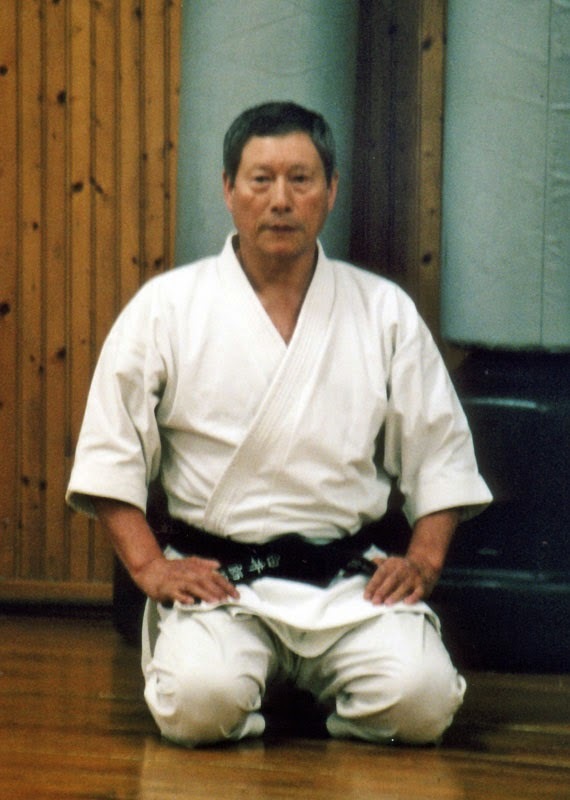 The first JKA instructor to be sent to the United States by Sensei Nakayama in 1964, today Sensei Yaguchi is the Chief Instructor, Mountain States Region of ISKF in Colorado, U.S.A. an organization founded by Sensei Teruyuki Okazaki, 9th Dan, in 1977 and affiliated with the JKA. 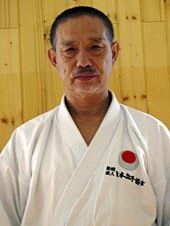 For additional information on Sensei Yaguchi please visit the ISKF web site at http://www.uniques.com/shotokan/ . Sensei Mikio Yahara was born in Ehime Prefecture, Japan in 1947. A graduate of Kokushinkan University and a JKA instructor he is today a legend within the Shotokan karate community for his remarkable fighting skill, a former JKA Kata and Kumite Champion his reputation precedes him where ever he goes. 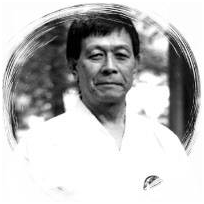 Sensei Yahara is today the Chief Instructor of the, Karate-no-michi World Federation, an organization he founded with Sensei Akihito Isaka, 8th Dan, with the aim of creating truly effective karate. A firm believer that karate must return to its original source and be a true reflection of Budo, Sensei Yahara trains with the constant goal of perfecting his technical skill. For additional information on Sensei Yahara please visit the KWF web site at http://nunokwf.planetaclix.pt/mikio_yahara_sensei_e.htm . Born in Nagasaki, Japan in 1937 Sensei Hiroshi Shirai is a graduate of Komozawa University in Tokyo where he studied karate under Sensei Hidetaka Nishiyama and he remains affiliated with him to this day. A graduate of the JKA Instructor Program where he came under the influence of Sensei Taiji Kase. A former instructor with the JKA and a former JKA champion Sensei Shirai has lived in Italy since 1965 and is currently the head of the Technical Committee of the International Traditional Karate Federation (ITKF) and is joined on this committee by Sensei Masao Kawasoe, 8th Dan, the overall head of the ITKF is Sensei Hidetaka Nishiyama. 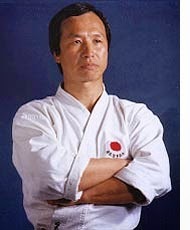 For additional information on Sensei Shirai please visit the ITKF web site at http://www.dtkv.de/trainer/shirai.htm . Born in 1940 Sensei Ochi started karate during his days at Takushoku University in Tokyo. A former graduate of the JKA's Instructor Program in 1964 he began teaching at the JKA Honbu dojo on a regular basis after passing his final examination. Kanzawa. In 1993 he formed his own organization Deutche Japan Karate Bund (DJKB) to help return German karate to more traditional roots and away from sport karate which was becoming ever more prevalent in that country. In 1997 he was awarded the German Medal of Honor for his contributions to the development of German Karate. For additional information on Sensei Ochi please visit the following web site at http://www.deutscher-jka-karate-bund.de/index-eng.htm . A new form of karate called Kyokushin was formally founded in 1957 by Masutatsu Oyama (who was born a Korean, Choi Yeong-Eui 최영의). 剛柔流 . It teaches a curriculum that emphasizes aliveness, physical toughness, and full contact sparring. Because of its emphasis on physical, full-force sparring, Kyokushin is now often called "full contact karate", or "Knockdown karate" (after the name for its competition rules). Masutatsu Oyama, the founder of the largest Karate organization started and established Bare-knuckle, Full-contact tournament system one of the top authoritative and influential figures in the world of Martial Arts history one of the pioneers in spreading the Asian Martial Arts to the West and to all over the world ever pursuing, ever a practitioner, he is recognized to be reached to the level of the true Mastery. The current World Headquarters were officially opened in June 1964, where the name Kyokushin, meaning "Ultimate truth" was adopted. In the same year the International Karate Organization (IKO) was established. From then, Kyokushin continued to spread to more than 120 countries, and registered members exceed 10 million making it one of the largest martial arts organisations in the world. July 27th, 1923, born in Southern Korea. 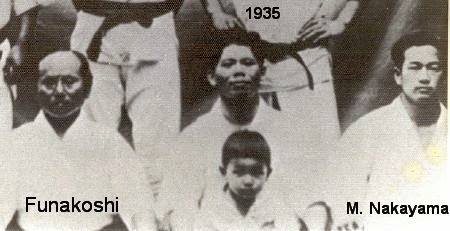 1938 - becomes student under Master Gichin Funakoshi of Shotokan Karate(松濤館流 ). 1946 - enters the mountain for training. 1947 - becomes the champion of All Japan Karate-do Tournament. He studies Goju-ryu Karate (剛柔流 ) extensively under Master Gogen Yamaguchi, and becomes Vice Chairman in the organization, holding 9th Dan degree. 1948 - enters the mountain alone for 18 months of training. 1950 - starts training against the live bulls, living beside the cattle butchery. Out of 47 bulls, 4 killed in instant. 1952 - visits America for Karate instructions and demonstrations in 32 locations. Has 7 times of real matches. 1953 - visits America, he fights against a bull in Chicago, where he breaks its horn by Shuto strike (knife hand). 1955 - goes all around South America and Europe with Bepford Davy, President of Chrysler Corp. He fights numerous mix matches. 1956 - starts small Oyama Dojo at an old ballet studio. 1957 - fights against a bull in Mexico City. 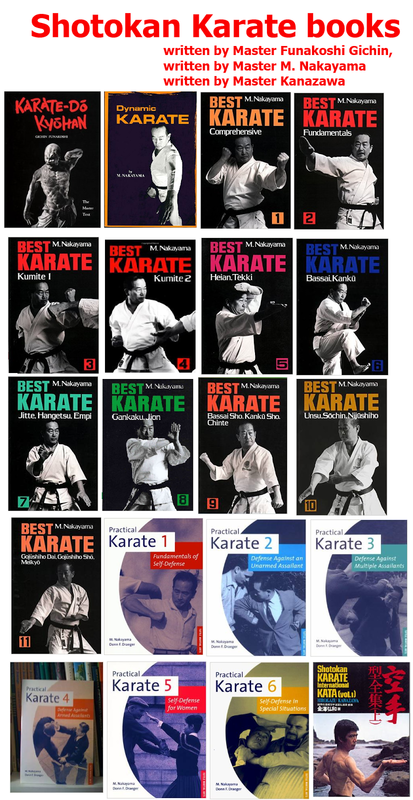 1958 - January, publishes "What is Karate" which becomes a best seller of 500,000 copies. September, invited by FBI in Washington D.C. for Karate instructions and demonstrations. October, invited by West Point Military Academy for Karate instructions and demonstrations. 1964 - Thai Boxing challenges Karate-do, where Oyama Dojo alone accepts. 3 matches 2 wins. 1971 - though a popular comic book series "Karate Baka Ichidai," and the movie "World's Strongest Karate" in 1975, his name and of Kyokushin become known all over Japan. 1975 - helds Kyokushin Kai's First World Karate-do Open Tournament. April 26, 1994. Dies of lung cancer at the age of 70. In addition to described above, he visits elsewhere researching and fighting real matches against other Martial Arts of the world. 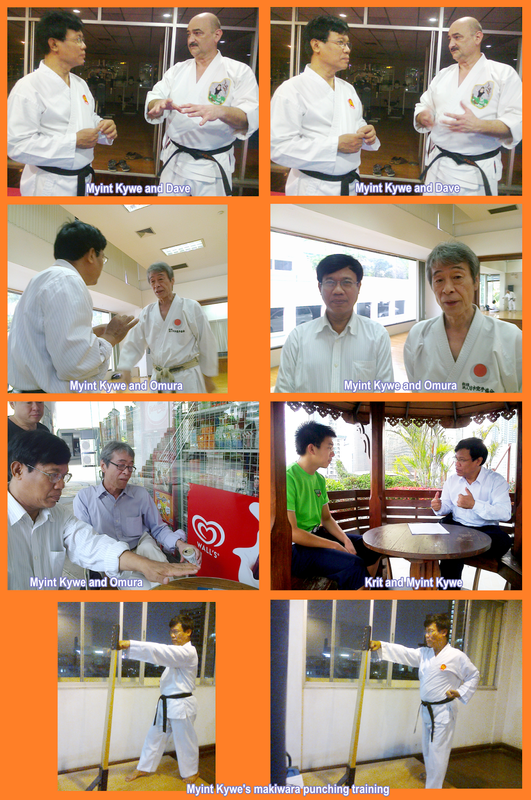 Kyokushin as the largest Karate organization, he has students numbered 12,000,000 in 140 nations worldwide. He is also noted for starting the Full-Contact, Bare-Knuckle tournament system. 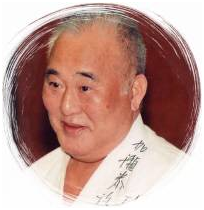 Masutatsu Oyama, the founder of Kyokushin Karate was born on July 12, 1923 in Korea. He lived on his sister's farm in Manchuria from infancy until age 12, during this time he studied Kung-Fu. Returning to Korea, he continued his martial arts training, then travelled to Japan in 1938. He trained in various martial arts disciplines in Japan earning his second degree (nidan) black belt in karate at age 17, and fourth degree (yondan) at age 20. The progress he made in his studies of Judo were equally astounding, achieving the rank of yondan in less than four years. 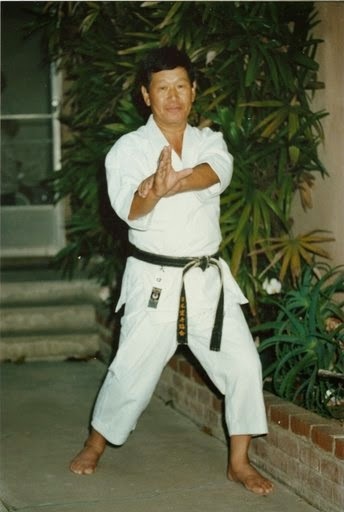 One of Mas Oyama's instructors in Karate, So Nei Chu, was to have a profound influence on Mas Oyama, when he advised him to make a firm commitment to dedicate his lifeto the martial way. Heeding his words to "seek solace in nature", Mas Oyama subjected himself to the rigours of daily training in the mountains of Chiba prefecture in order to strength his own body and spirit. He was accompanied by one of his own students, but after six months of isolation, the student secretly fled, leaving Mas Oyama to continue his vigourous training alone. Returning to civilization after one year of solitude, he tested his abilities in the karate division of the first national martial arts championships, and won. 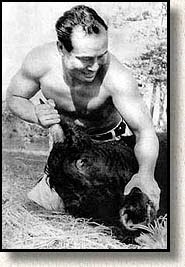 Mas Oyama then imposed on himself a further period of solitary training, again in the mountains, and upon his return, demonstrated his remarkable ability by fighting bulls. He fought a total of 52 bulls, killing three and breaking the horns off 49 others. His fame as a karateka spread rapidly as his feats were unparalled and in 1954 he opened his first dojo in Tokyo, Japan. This dojo was the beginning of the Kyokushin KaiKan. In 1964, the Tokyo Honbu (headquarters) was officially opened and the International Karate Organization (IKO) was established. Today, the IKO, headed by Kancho Shokei Matsui, is the largest karate organization in the world with over twelve million members in 135 countries. Why you should learn karate? 1. Karate is not about violence: It's about self-defence (self protection), health and sport. 2. Karate is suitable for men, women, adults, teenagers, children, and all ages from ages 4 to 75. Karate relaxes the body and mind. 3. Karate is a good family activity as well as a good personal activity. 4. There is no first attack to other in karate. 5. Karate stands on the side of justice. 6. Make response just need a small adjustments according to your opponent. Most educated people associate karate with discipline. This is because of the format in which the classes are taught. In karate there is a ranking system which lets people know where they stand. 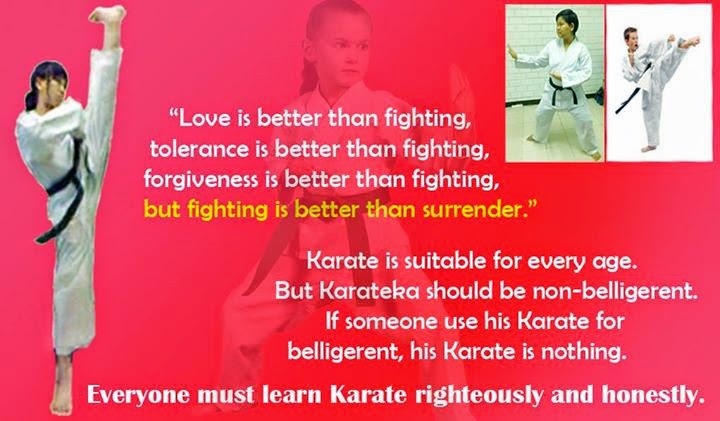 Karate doesn't have to be militaristic to the point it was originally intended (after all it is a martial art developed to defend ones' life) but these values are instilled. はじめに There are three components to Shotokan karate training: 基本 kihon 形, kata, and 組手 kumite. Each plays a crucial role to the development of karate skills. While particular teachers and particular training sessions may emphasize some (or only one) components, none of them can be neglected in the course of one's training. 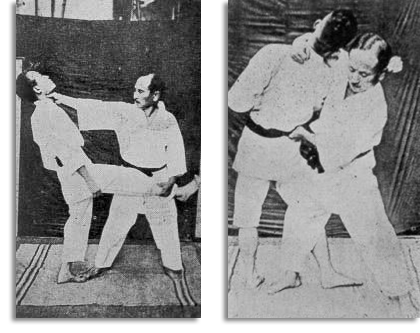 基本 Kihon is the practice of fundamental techniques: blocking, punching, striking, and kicking. These techniques are the beginning and end of karate -- a karateka (practitioner of karate) may learn them in a matter of months, yet fail to master them after a life's worth of training. Hence, basic techniques demand regular practice, applied with as much concentration and effort as possible. フォーム Balance and stability are necessary to basic techniques. 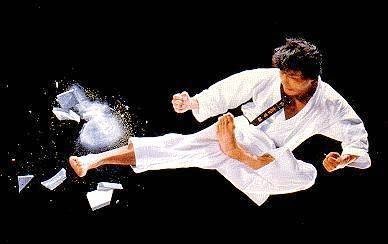 Kicking -- in which one leg supports the entire body -- is an example of technique that depends on the karateka's sense of balance. Karate movements involve shifting the body's center of gravity, which demands good balance and control of the body. In addition, the karateka requires stable joints, stances, and posture to deliver (or withstand) maximum impact in (or from) a blow. 力とスピード Karate would be meaningless without kime, the ability to concentrate the greatest amount of force at the point of attack (or block). Those with great muscular strength do not excel at karate, if they never learn to use their muscles to the greatest effect. The karateka who excels, does so by maximizing her muscular power through kime. In addition, the karateka's power is directly related to the speed of her techniques. However, speed is ineffective without proper control. 力の集中と脱力 The karateka cannot generate maximum power if her punches rely on the arm's muscles alone, or her kicks on the leg's muscles alone. The greatest level of power comes from concentrating all of the karateka's strength, from every part of the body, on the target. In addition, the karateka must generate power efficiently, using power when and where it is needed. Maximum power is required only at the point of impact. Until then, the karateka should stay relaxed and avoid generating unnecessary power. By tensing the wrong parts of the body or tensing at the wrong time, the karateka only diminishes the amount of power that goes into her block or attack. While she is relaxed, the karateka should stay mentally alert. 筋肉強化について The karateka must not only understand the principles of kihon, she must give them effect with strong, elastic muscles. Strong muscles demand constant, earnest training. They also require the karateka to know which muscles to use in her techniques: well-trained muscles will lead to strong and effective karate. リズムとタイミング Karate has its own rhythm that karateka should come to recognize and understand. No technique takes place in isolation; in combining basic techniques, the karateka should pay attention to the timing of her techniques as well as the techniques themselves. A master karateka's movements not only contain a great deal of power but also rhythm and, in their own way, beauty. A sense of rhythm and timing will help the karateka understand the techniques and the art in general. 腰 The hips are a crucial, yet oft-neglected component in executing karate techniques. Hip rotation adds power to the upper body, and is thus essential to strong blocks and punches. The hips' proximity to the body's center of gravity make them the foundation of strong, stable movements, good balance, and proper form. The karateka cannot move as smoothly, quickly, or powerfully if the hips are passive. For this reason, teachers often remind their students to "block with your hips," "punch with your hips," and "kick from your hips." 呼吸法 The karateka should coordinate breathing with her techniques. Breathing enhances the karateka's ability to relax and concentrate maximum power in her techniques. Correct breathing -- fully exhaling when finishing a strike, for example -- is necessary to developing kime. The karateka should not breathe in a uniform manner; her breathing should change with the situation. Proper inhaling fills the lungs completely. Proper exhaling leaves the lungs about 20 percent full -- exhaling completely makes the body limp, leaving the karateka vulnerable to even a weak attack. 形・型 The kata are formal exercises which combine basic karate techniques -- blocking, punching, striking, and kicking -- into a series of predetermined movements. Kata combines offensive and defensive techniques, proper body movement, and changes in direction. The kata teach the karateka to dispose of numerous attackers from at least four directions. Although the kata do not involve visible opponents, the karateka, through serious study of the kata, learns the art of self-defense and the ability to calmly and efficiently deal with dangerous situations. For these reasons, the kata have been the core of karate training since ancient times. 1. For each kata, there are a fixed number of movements. (The basic Heian kata have 20 to 27 movements; advanced kata can have over 60.) One must perform the movements in the correct order. 2. One must begin and end the kata at the same point on the floor. Each kata has its own "shape" -- depending on the kata, the karateka may move along a straight line or a "T"- or "I"-shaped formation. 3. There are kata that all karateka must learn, and kata that are optional. The former consist of the five Heian kata and three Tekki kata. (Today, Tekki 2 and Tekki 3 are usually optional.) The optional kata are Bassai-dai (although most brown belts practice this for their black belt exam) and Bassai-sho , Kanku-dai and Kanku-sho, Empi, Hangetsu, Jitte, Gankaku, Jion. Other kata include Meikyo, Chinte, Nijushiho, Gojushiho-dai and Gojushiho-sho, Hyakuhachiho, Sanchin, Tensho, Unsu, Sochin, Seienchin, Ji'in, and Wankan. 4. There are three aspects to performing a dynamic kata: (1) correct use of power; (2) correct speed of movement, be it fast or slow; (3) expansion and contraction of the body. The kata's beauty, power, and rhythm depend on these aspects. 5. One bows at the beginning and end of the kata. Bowing is part of the kata, too. 組手 Kata and kumite are complementary training methods. In kata, one learns basic techniques; in kumite, one applies them with a sparring partner. 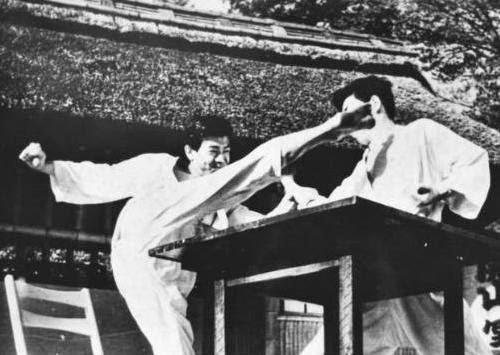 The principles of kihon (see above) still apply to kumite: the karateka must apply proper karate techniques, demonstrate correct power and speed, and, above all, exercise good control -- contact is prohibited. One must remember that, while kumite is a useful application of the fundamentals learned through kata, it is not a substitute for kata. 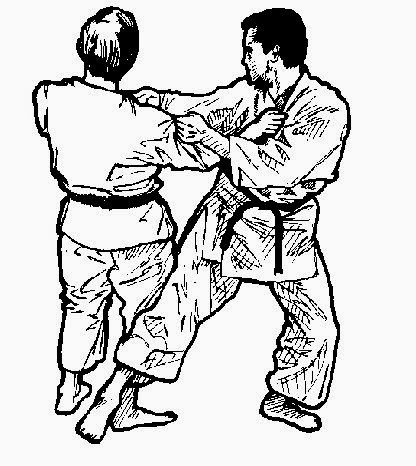 基本組手 consisting of five- or three-step sparring, permits the karateka to cultivate basic blocking and attacking through prearranged techniques. It is a useful introduction to sparring for beginning students. 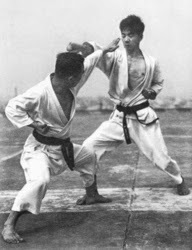 一本組手 also involves basic, prearranged techniques, but adds emphasis on body movements and proper distancing from the opponent. 自由組手 In Jiyu kumite techniques are not prearranged. The karateka may freely engage her physical and mental powers, but must strictly control her attacks -- contact is prohibited. The karateka must be well-trained and disciplined enough to make a powerful blow that stops just before it reaches its target. For these reasons, only advanced students may practice jiyu kumite. Generally a person who enters a karate class will see that people will bow to each other, call the instructor Sensei (teacher) and conform to the rules and guidelines set forth by the club. This makes a person feel rather awkward themselves if they don't conform to their surroundings. If there is a problem child or an adult with an overbearing demeanor they will be dealt with on a personal level. Most difficult people can be taught humility simply by being in an environment where it is prominent. Karate is a physical and mental discipline of self-defense based on courtesy, respect, humility, character, health, skill, patience (tolerance), and nonviolence. Karate will always be a part of my life. Best Karate, Vol. 1, Masatoshi Nakayama.